PetroChina Company Limited (NYSE:PTR) shares haven’t seen a lot of action during the third quarter. Overall, hedge fund sentiment was unchanged. The stock was in 14 hedge funds’ portfolios at the end of December. The level and the change in hedge fund popularity aren’t the only variables you need to analyze to decipher hedge funds’ perspectives. A stock may witness a boost in popularity but it may still be less popular than similarly priced stocks. That’s why at the end of this article we will examine companies such as 3M Company (NYSE:MMM), Adobe Inc. (NASDAQ:ADBE), and Novo Nordisk A/S (NYSE:NVO) to gather more data points. We’re going to take a peek at the new hedge fund action regarding PetroChina Company Limited (NYSE:PTR). At the end of the fourth quarter, a total of 14 of the hedge funds tracked by Insider Monkey were bullish on this stock, a change of 0% from the second quarter of 2018. On the other hand, there were a total of 7 hedge funds with a bullish position in PTR a year ago. So, let’s examine which hedge funds were among the top holders of the stock and which hedge funds were making big moves. According to publicly available hedge fund and institutional investor holdings data compiled by Insider Monkey, Renaissance Technologies, managed by Jim Simons, holds the largest position in PetroChina Company Limited (NYSE:PTR). Renaissance Technologies has a $57.1 million position in the stock, comprising 0.1% of its 13F portfolio. 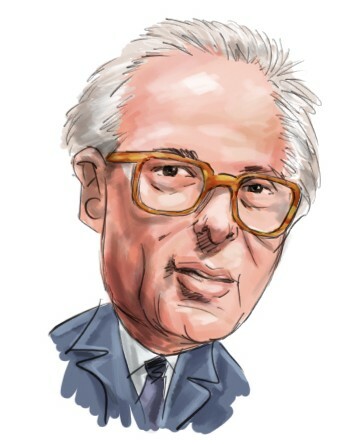 The second largest stake is held by Arrowstreet Capital, managed by Peter Rathjens, Bruce Clarke and John Campbell, which holds a $35.2 million position; the fund has 0.1% of its 13F portfolio invested in the stock. Other hedge funds and institutional investors that hold long positions contain Ben Levine, Andrew Manuel and Stefan Renold’s LMR Partners, Cliff Asness’s AQR Capital Management and Israel Englander’s Millennium Management. Because PetroChina Company Limited (NYSE:PTR) has witnessed bearish sentiment from the entirety of the hedge funds we track, it’s easy to see that there exists a select few money managers who were dropping their full holdings last quarter. At the top of the heap, Steve Cohen’s Point72 Asset Management sold off the largest investment of all the hedgies monitored by Insider Monkey, valued at an estimated $8.1 million in stock, and Gavin Saitowitz and Cisco J. del Valle’s Springbok Capital was right behind this move, as the fund sold off about $0.9 million worth. These moves are important to note, as aggregate hedge fund interest stayed the same (this is a bearish signal in our experience). Let’s now take a look at hedge fund activity in other stocks – not necessarily in the same industry as PetroChina Company Limited (NYSE:PTR) but similarly valued. We will take a look at 3M Company (NYSE:MMM), Adobe Inc. (NASDAQ:ADBE), Novo Nordisk A/S (NYSE:NVO), and Sanofi (NASDAQ:SNY). This group of stocks’ market valuations resemble PTR’s market valuation. As you can see these stocks had an average of 40.25 hedge funds with bullish positions and the average amount invested in these stocks was $2817 million. That figure was $134 million in PTR’s case. Adobe Inc. (NASDAQ:ADBE) is the most popular stock in this table. On the other hand Novo Nordisk A/S (NYSE:NVO) is the least popular one with only 18 bullish hedge fund positions. Compared to these stocks PetroChina Company Limited (NYSE:PTR) is even less popular than NVO. Our calculations showed that top 15 most popular stocks among hedge funds returned 19.7% through March 15th and outperformed the S&P 500 ETF (SPY) by 6.6 percentage points. Unfortunately PTR wasn’t in this group. 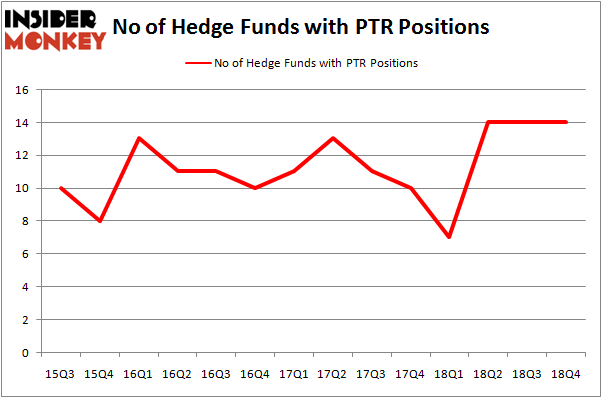 Hedge funds that bet on PTR were disappointed as the stock returned 5.8% and underperformed the market. If you are interested in investing in large cap stocks, you should check out the top 15 hedge fund stocks as 13 of these outperformed the market. Were Hedge Funds Right About Merck & Co., Inc. (MRK)? Do Hedge Funds Love Taiwan Semiconductor Mfg. Co. Ltd. (TSM)? Here is What Hedge Funds Think About Cisco Systems, Inc. (CSCO) Should You Buy The Boeing Company (BA)? Were Hedge Funds Right About Novartis AG (NVS)? Were Hedge Funds Right About The Coca-Cola Company (KO)?